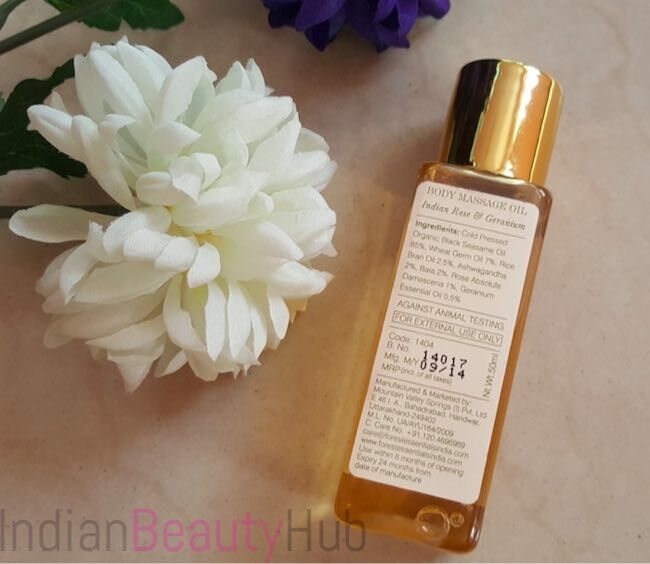 Hey everyone, today I’m reviewing the Forest Essentials Body Massage Oil Indian Rose & Geranium. It is a cold pressed massage oil infused with ayurvedic herbs and rose with geranium essential oil. It was a part of the FE Travel Essential Rose Kit that I bought a few months back. I’ve already reviewed the body lotion, bath oil and shower gel from the same kit. Packaging: Forest Essentials Body Massage Oil comes in a clear plastic bottle with a golden cap. A white plastic lid is further provided inside the cap to prevent leakage of the oil. All in all the packaging looks very luxurious, but it is not very travel-friendly. 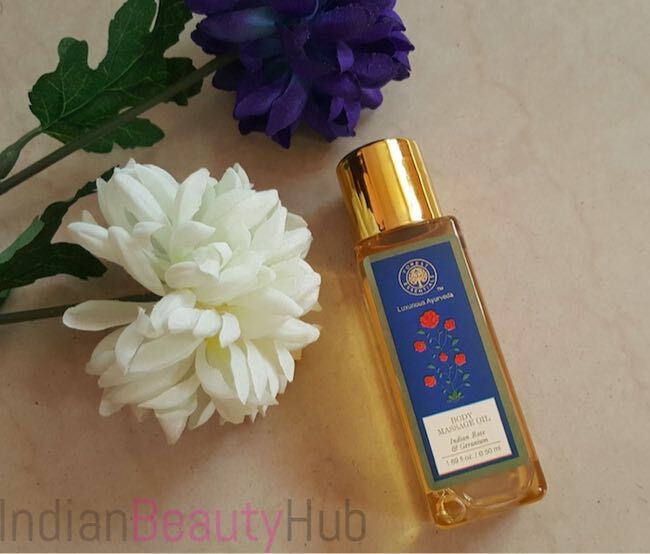 Texture & Fragrance: Forest Essentials Indian Rose & Geranium Body Massage Oil comes in a golden yellow color. It has a non-sticky lightweight texture that absorbs quickly into the skin. It has a rose essential oil fragrance which I found a little strong. 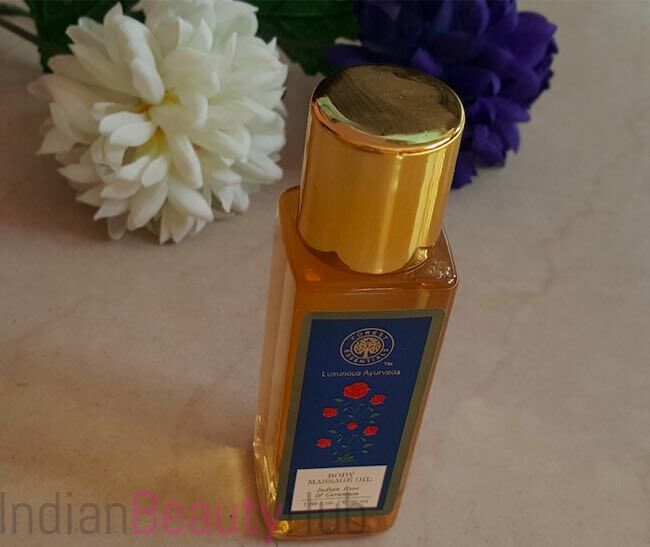 Price & Availability: The price of the Forest Essentials Indian Rose & Geranium Body Massage Oil is Rs.1,150 for 200ml (you can buy it for Rs.975 from Amazon.in). 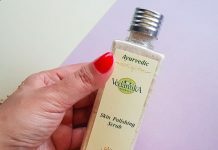 It can be bought from FE stores and also online from Flipkart.com, Amazon.in, Nykaa.com or Forestessentials.com. Efficacy: I generally pour a small quantity of the oil in my palm and massage it nicely all over my body. It spreads easily and gets completely absorbed into the skin without giving an uncomfortable sticky feeling. The soothing aroma of this oil helps in relaxing the tired mind & body while massaging it on the body. I keep it on for good 1-2 hours before taking a bath. It washes off easily with a regular body cleanser and normal water. 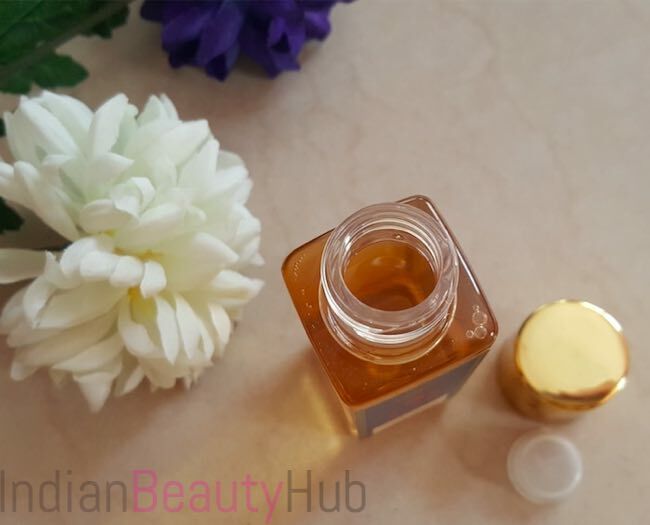 After using this massage oil my skin feels soft, nourished and pleasantly fragrant. It also leaves my skin hydrated and glowing for good 2 days. I use this oil only once or twice a month and really noticed a remarkable difference in my skin’s texture. 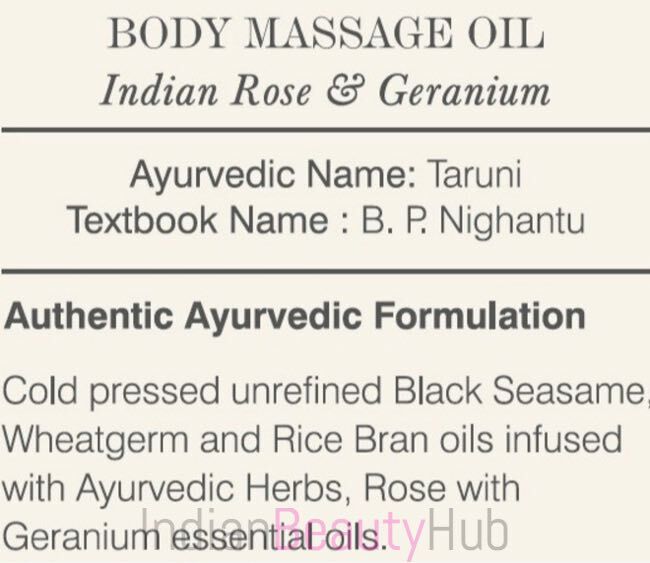 It is infused with 100% natural ingredients like sesame oil, wheat germ, rice bran oils, ayurvedic herbs, and rose with geranium essential oil. A non-greasy light formula that absorbs quickly. 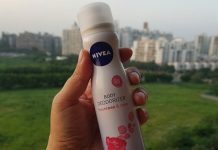 It makes skin soft, supple and glowing. Has a pleasant rose fragrance to it. Its aroma is very soothing & relaxing, it feels like indulging yourself in a luxurious spa. A little quantity required during each use and the 200ml bottle will easily last for 3-4 months. The bottle comes with a big mouth opening that can lead to leakage of oil. Even the inside plastic lid is unable to prevent the spillage of the oil that makes it not so travel-friendly. Quite expensive and they’ve also increased the price of this massage oil from Rs.975 to Rs.1,150. The fragrance is quite strong that can bother some people. Also, the fragrance choice is a subjective thing so some people may not like its rose fragrance. 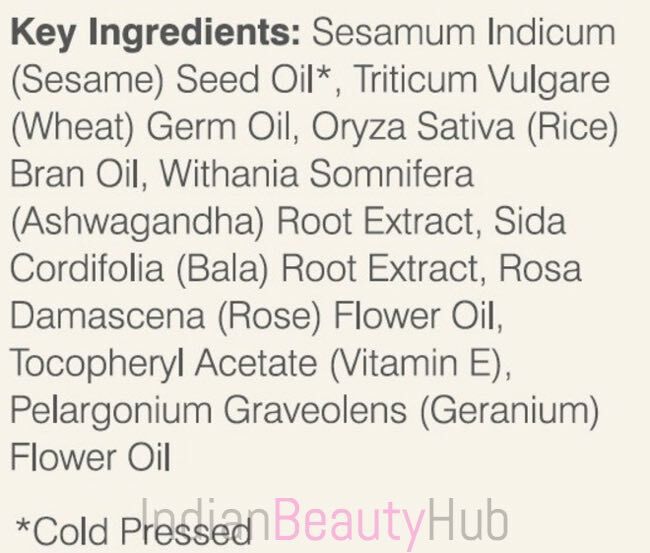 Claims: Cold pressed unrefined Black Sesame, Wheatgerm and Rice Bran oils infused with Ayurvedic Herbs, and Rose with Geranium essential oil which firm and gives lustre to the skin. Overall I liked Forest Essentials Body Massage Oil Indian Rose & Geranium. 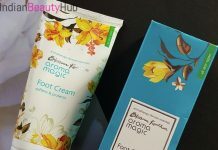 If you want to experience a luxurious spa at the convenience of your home then you should definitely check out this oil from FE. The only drawback of this massage oil is its high price. But still if you are a rose fragrance lover and don't mind splurging Rs.1150 then you should definitely buy this product. Recommended!